Well I just wanted to share this blog with you. 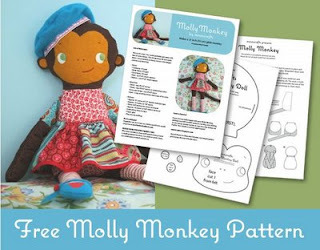 There is a free pattern for the monkey doll pictured above. SO CUTE!! About your OWOH participation... Lisa says very clearly on the page: "KEEP IN MIND THAT THIS IS AN INTERNATIONAL EVENT.....therefore you must be willing to ship globally should your winner be from out of the country. IF you feel that you cannot ship out of your country you may not want to participate."